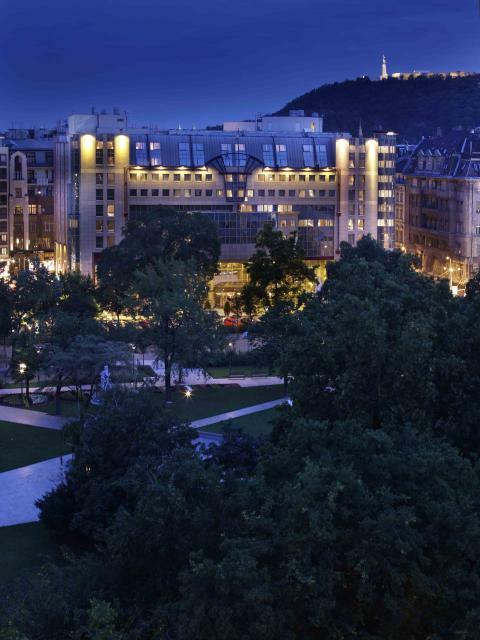 Modern and luxurious Kempinski Hotel Corvinus is a short walk from the Danube and the main attractions, right in the heart of Budapest, in the Fashion Street. The 359 elegant rooms, including 33 suites, are equipped with spacious bathrooms, high-tech infotainment system, free WIFI internet and air-condition. The Asian inspired Kempinski Spa has a swimming pool, saunas, steam bath, gym and a Tepidarium. It offers a wide range of exclusive massages and treatments. There are also boutiques, laundry, dry-cleaning, 24-hour Room Service, Business Center and an underground garage. The Restaurant Giardino (with Summer Terrace) specialises in Hungarian and Mediterranean cuisine. The Lobby Lounge & Bar is an international meeting place. The Fashion Lounge is a seasonal highlight on the pedestrian zone. There are 10 salons and meeting rooms with seating for up to 450 delegates suitable for conferences, meetings, lunches, dinners, wedding parties, exhibitions, fashion shows etc. All of the meeting rooms are ideally located on one floor and are equipped to the highest technical standards to suit all needs. The 359 elegant rooms, including 33 suites, are equipped with spacious bathrooms, high-tech infotainment system, free WIFI internet and air-condition. The Restaurant Giardino (with Summer Terrace) specialises in Hungarian and Mediterranean cuisine. The Lobby Lounge & Bar is an international meeting place. The Fashion Lounge is a seasonal highlight on the pedestrian zone. The first NOBU Restaurant opened on site in 2010. 24-hour Room Service - including NOBU dishes. Modern and luxurious Kempinski Hotel Corvinus is a short walk from the Danube and the main attractions, right in the heart of Budapest, in the Fashion Street. Liszt Ferenc International Airport is located 20 km from the hotel. Train Station West is 2 km from the hotel. Easy access by car arriving from Vienna on the M1 motorway.